I don't remember going to prison. I was too young. But I do remember my mother carrying a bag of rice with us onto a boat and that is it. Apparently we got caught and that was that - perhaps a blessing in disguise as we probably would have died at sea. She often talks about how it would have been if we would never have made it across to England. How she would not have been able to afford an education for me, I would have ended up selling something in the market but I would have a family by now with lots of children. I have just been in California to visit my grandparents - a family reunion for their 60th anniversary. We had a five day emotional packed event, reminiscing the past, comedy, music, performances and giving thanks. There were over 20 of us, their sons and daughters, in laws and grandchildren. When we all had to take our turn to speak - something to say about our love for our grandparents, it was full of bravery and tears. We dived into the deepest parts of ourselves and gave them everything we had, even the locked away feelings we rarely touch upon. My Uncle Hien started the tears rolling. To his surprise as well as ours, Hien could only stutter his words, struggling with the emotions that came thrusting forward like a wave of tsunami - engulfing his whole persona. He thanked my grandfather for the time which was over 30 years ago when he visited him in prison every month, bringing him food for two years without fail. It is not like Uncle Hien to cry because he is a man who always smiles, who always laughs and who always jokes. He only mentions the positives. He told in Vietnamese to his father how he is most grateful, thankful and humbled by the visits. 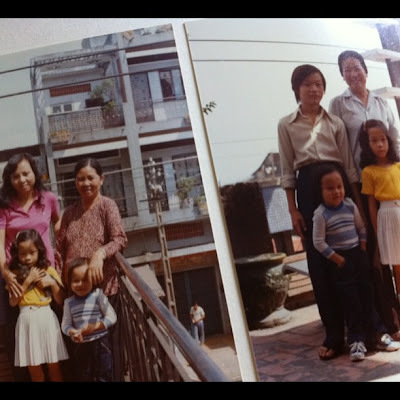 After the fall of Saigon, Uncle Hien was on a boat to escape with 127 other people. After a week at sea, the Communists caught them and threw them into a 100sqm cell with a mezzanine floor at head height to bed the other 400 people whom eventually crammed in. He said that you had to sleep on your side right next to each persons because that was how you could fit. For men, the normal time to spend in prison is 1 year. For women and children, 3-6 months but for the 127 people, it was 2 years. There was a woman on the boat, she had a male name for some reason and she got 2 years with the rest of them. 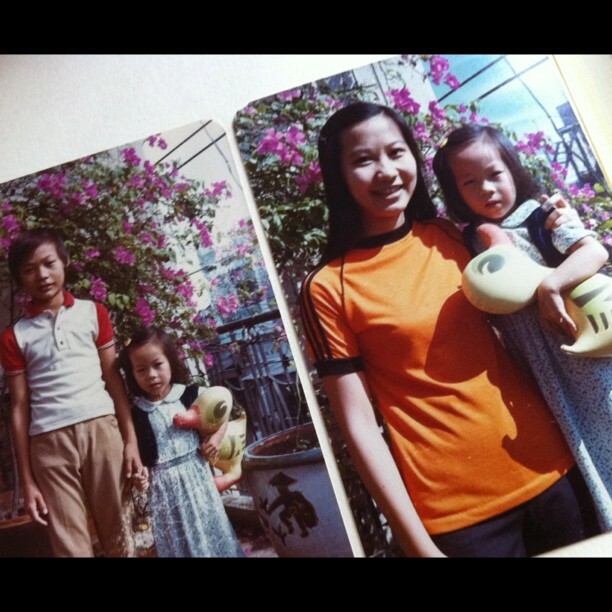 My uncle, Hien, is the spitting image of my father. He reminds me of him and all I see in him are the positive aspects of what could have been for me - a father. I have never had a relationship with my father except the one where I felt I missed him so much when he left us for years and decades until I eventually gave up missing and filled the void with a photo album of pictures taken by Uncle Hien. All my memories of childhood in Vietnam contain that of my Uncle Hien and even on my right hand, I have a scar that will never let me forget him because when Hien was in prison, he cut from a stainless steel bowl, a bracelet for me. He engraved it beautifully with my full name and patterns, polished it and sent it back to Saigon with my grandfather for me. I loved it and wore it all the time. But one day, a day I will never forget, even though I was very young, I fell on the marble stairs as I ran either up or down to play. The stairs are always well lit with daylight in our 5 storey house. It spiralled in a square overlooking a large water well where my kittens would often hang out. I tripped somehow and the bracelet cut sharply into the centre across my little hand. My mother, my grandmother, my aunts and all the neighbours were screaming and panicking high pitch fever. It was as if they were terrified I would loose my hand but luckily, the cut sliced on both sides of the artery but not the artery, missing it completely. Now, that I grew up and so did my hand and the scar appears smaller than before, the artery is like a bridge that crosses the scar. "I was lucky," he tells me. We sat privately in a room for 2 hours talking about his prison experience,"I was really lucky because I could sing, I could dance, I could play the guitar and the drums so they made me the entertainer. I didn't have to work so hard in the fields." They made the prisoners build a canal. The prisoners had to dig non stop into the dirt in a valley. You couldn't escape because you'd have to climb the valley and that was where they would see you and shoot you. They often made example of people who tried to escape by displaying corpses till they would rot. And after all the digging, they were given half a bowl of rice with salt twice a day. Once at 10am and once at 3pm. "Life was really really hard…"
My grandfather used to travel for the whole day to reach him. The visit lasted only 5 minutes every month and this was when my grandmother packed all sorts of food for him to last a month. My grandmother set up a cafe in our home selling Bun Bo Hue - a hot and spicy noodle soup with lemongrass and beef with pig's trotter broth. This would fund the monthly prison visit trips. One day in July, unknown to my uncle and the 127 prisoners, they were told that they could go. After 2 years. It was a total shock to the system. "we ran back to our cell and we gave everything away to the others and we ran with just the clothes on our backs. We ran as fast as we could in case they would change their minds. We didn't even know where we were going - we just ran." It was a day that changed his life and his whole outlook on life. "We ran into people and they helped us with some food and someone gave me a little money to get home." Present Day, Uncle Hien Playing With His Niece Megan. Uncle Hien came home out of the blue and covered in dirt. He spent a good few years continuing the Bun Bo Hue business to help the family and repay his debt to them whilst he was imprisoned. He got up at 3am to prepare the broth, prep the herbs, banana blossom and noodles. My grandmother would then sell it. He would then prep the meat in the afternoon for the next day and shop for all the ingredients, prepare the blood cakes and start over. He was like a father to me and still is like a father to me from afar. He always sang and taught me songs. He drew pictures and made paintings and encouraged me to do the same. He took pictures with a Canon AE-1 and one day, he gave me that camera and I carried it around the world. 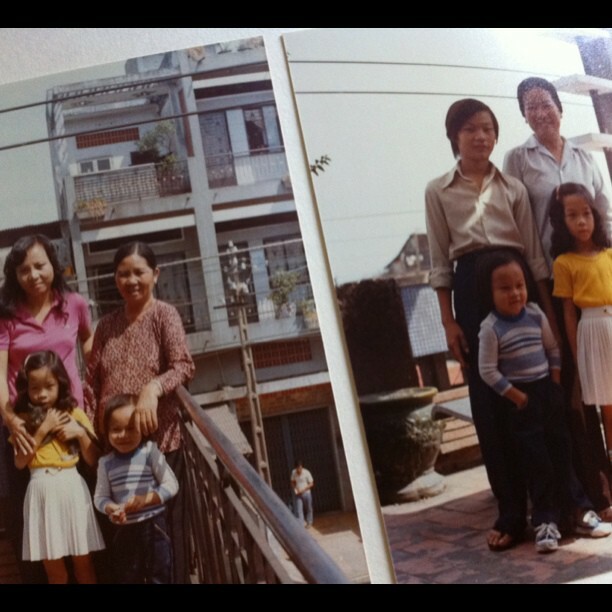 My uncles Thu & Vinh in Brooklyn managed to sponsor the entire family to America. Uncle Hien & Yung, Aunt Mai & Van had to go to Indonesia to learn English. It was where they learned that people who loved and missed them tried to escape to be with them but they didn't make it. They died at sea.